Hopping from one continent to another, Olivia Palermo is out to prove that she deserves to be called a style icon! This style maven would never miss an opportunity to attend a number of runway shows! She was everywhere during New York Fashion Week, attending a lot of fashion presentations while displaying her incredible taste in style. After NYFW, she flew straight to the United Kingdom for London Fashion Week. The 28-year-old socialite is very skilled in putting together pieces that may be hard to pull off. For the Matthew Williamson show, she chose a bespoke “Star Jacquard” coat from the brand’s latest winter collection. It features a unique ethnic pattern and a bold combination of colors. She completed her stylish look with a pair of Dior sunglasses, a Smythson “Grosvenor” clutch, a cuff, a watch, and loafer-style shoes. As if the prints on her coat were not enough, Olivia opted for embroidered flats by Alexander McQueen. They are made of black suede and feature floral and butterfly embroideries. 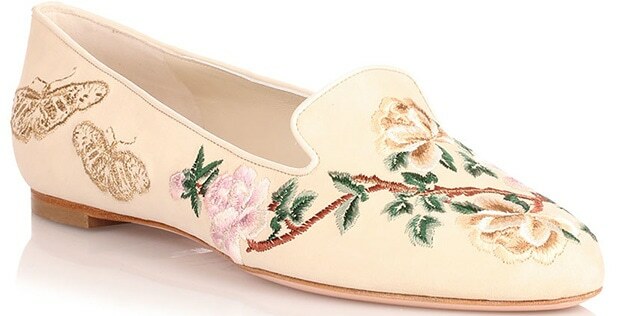 Olivia’s version of the flat shoes is already sold out online. However, other versions are still available at Saks and Neiman Marcus.